They're lightweight, compact and the future of camcorder technology. Flash memory first came to consumer's attention as the "digital film" in a digital camera. 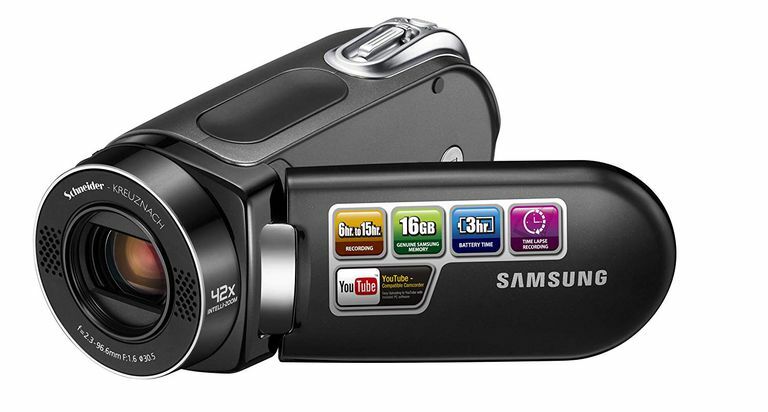 Now, the same memory cards found in digital cameras are being used in a new breed of camcorders: flash camcorders. A camcorder can record to flash memory in one of two ways. First, the flash memory can be built into a camcorder. Alternatively, the camcorder can record directly to removable flash memory cards, such as SDHC cards or Memory Stick. Camcorders with internal flash memory will generally also offer a memory card slot, giving you the opportunity to extend your recording times by using an optional memory card. Check out our list of the Best Flash Camcorders to find the top models currently on the market. What Kind of Camcorders Record to Flash Memory? The short answer is: all of them. You'll find flash memory used in very inexpensive, pocket camcorders, middle of the road standard definition camcorders to very high-end, high definition camcorders. All the major camcorder manufacturers offer flash camcorders in their line up. What Are the Benefits of Flash Camcorders? Light weight: Flash memory itself is not only lighter than a hard disk drive or tape, it doesn't need a bulky apparatus to operate it. The end result is a camcorder that's very light weight. Compact Size: Because the flash memory itself is small and doesn't require large components inside the camcorder to operate, flash camcorders are compact and very portable. This is why pocket camcorders, like Pure Digital's Flip, use flash memory as their a storage format. Longer Battery Life: Unlike a hard disk drive, tape or DVD, which must spin inside a camcorder when they're turned on, flash memory has no moving parts. That means that flash camcorders won't waste battery life spinning a tape or disk mechanism, giving you longer recording times. High capacity: While they don't boast the large capacities of hard disk drives, flash camcorders can still top MiniDV tape and DVD disk when it comes to storing hours of video. Reusable: When your flash memory card is packed with videos, you don't need to run out and buy a new one, as you do with tapes or DVDs. Instead, you can transfer that footage to a PC, external hard drive or disk and reuse your card. Are There Downsides to Flash Camcorders? The principle drawback to a flash camcorder is its capacity compared to hard disk drive-based camcorders. There are hard disk drive camcorders with over 200GB worth of storage space, while the largest flash memory camcorder tops out at 64GB. Even adding a high capacity memory card won't get you close to the capacity of a large hard disk drive.